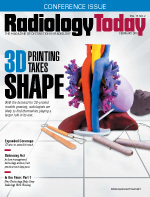 It seems as though radiology technology is advancing rapidly on many fronts, so we have a little something for everyone this month. In our cover feature, Jeannette Sabatini provides an update on the state of 3D printing. More players are coming into the market and technological refinements are pushing the limits of what 3D printing can do. It continues to gain ground in education and surgical planning, and it's making progress with implants. You still can't print replacement organs but researchers are already developing 3D-printed models that mimic organic tissue. If you're wondering what's new in CT, Keith Loria has a roundup of what the major manufacturers are up to and where the market is headed. There were many new releases at RSNA 2017, and you can read all about them on page 14. Of course, one of the big advances in the past few years has been a reduction in the amount of radiation dose that CT machines emit. Dan Harvey looks at some of the technology and best practices that can help keep dose as low as reasonably achievable while maintaining image quality. Finally, in the first installment of a two-part series, Beth W. Orenstein reports on technology that is enhancing radiology workflow. From cloud-based systems to artificial intelligence, new innovations are making workflow more streamlined than ever.